Do you need to increase your productivity and feel more energetic every day? Now you have the perfect tool. 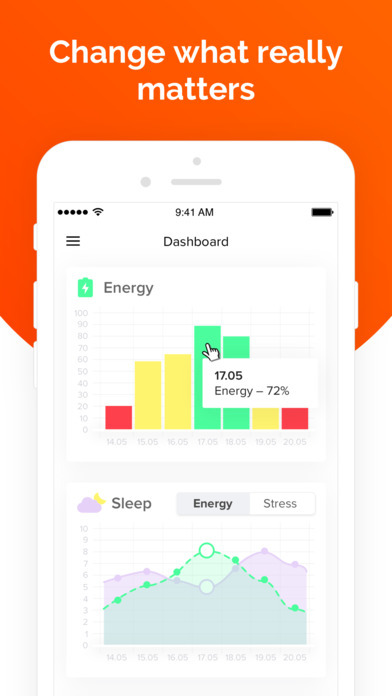 You can track your stress & energy level and change your lifestyle for better performance using science and our data-driven approach. 1. 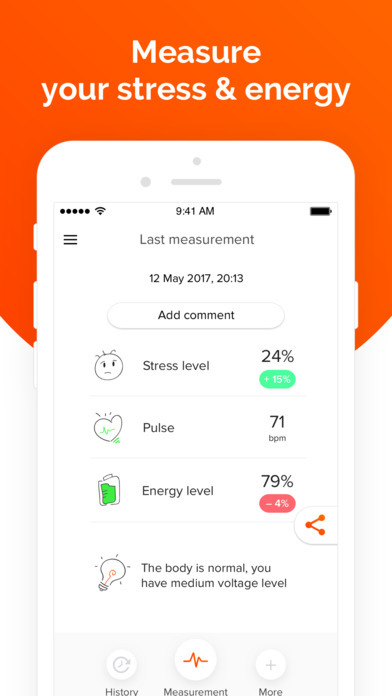 Measure your energy and stress levels using a heart rate monitor or smartphone camera. It is based on your heart rate variability (HRV), which is also used in professional sports and space medicine. 2. Find out how your stress & energy balance influences your productivity (yes, you can track it too). 3. See how your diet, number of steps, sleep and meditation affect you with the help of various trackers plugged into the app. • Sleep: Mi Band, Fitbit, Beddit, Jawbone, Mistfit, SleepCycle, etc. Measure — Get Insights — Change your habits — Track real progress. Become a better version of yourself using our experimental, quantified approach. Improve your focus, performance, energy and health with Welltory. 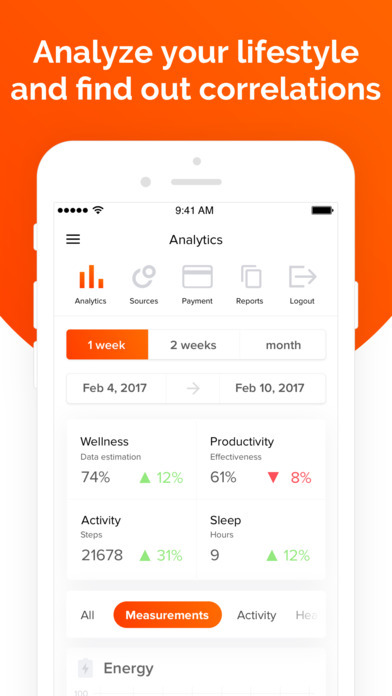 Learn more about the science behind the app on our website: http://welltory.com/sience. 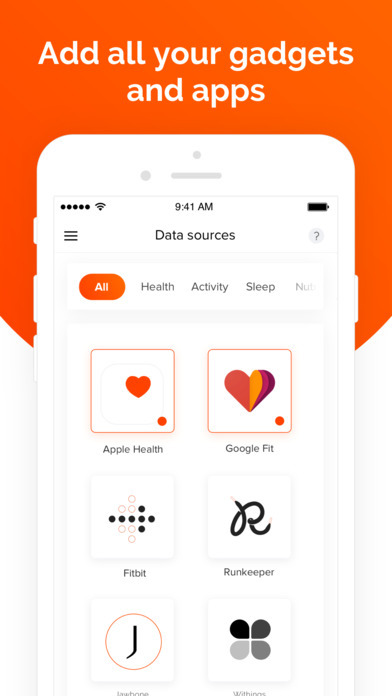 Possiblities to connect your fitness trackers and other apps and gadgets to Welltory to record data about your sleep, productivity, nutrition, physical activity and geolocation. Access to more advanced web dashboard. Consultations with our experts for tailor-made recommendations. 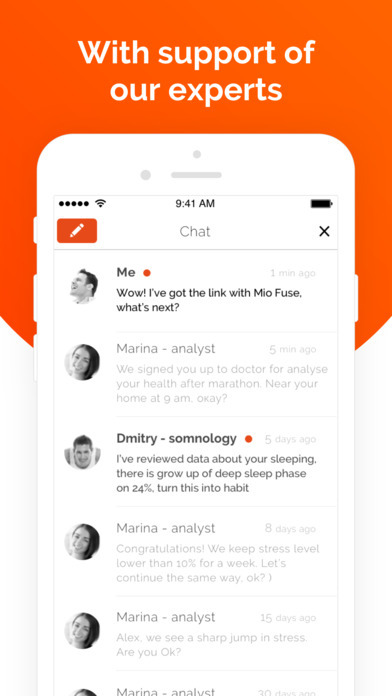 You can get personalized recommendations from our health analytics right in the app’s built-in chat window. Moreover, they can suggest you a bunch of different tests and quizzes to evaluate yourself. - Your subscription automatically renews 24 hours prior to the end of the subscription term unless auto-renewal is turned off. Subscription renewals cost the same amount as the original subscription, and your credit card will be charged through your iTunes account at confirmation of purchase. - You may turn off auto-renewal at any time after purchase by going to your iTunes Account Settings, but refunds will not be given for any unused portion of the term. - The above prices are for U.S. customers. Pricing in other countries may vary, and charges may be converted to your local currency depending on your country of residence.